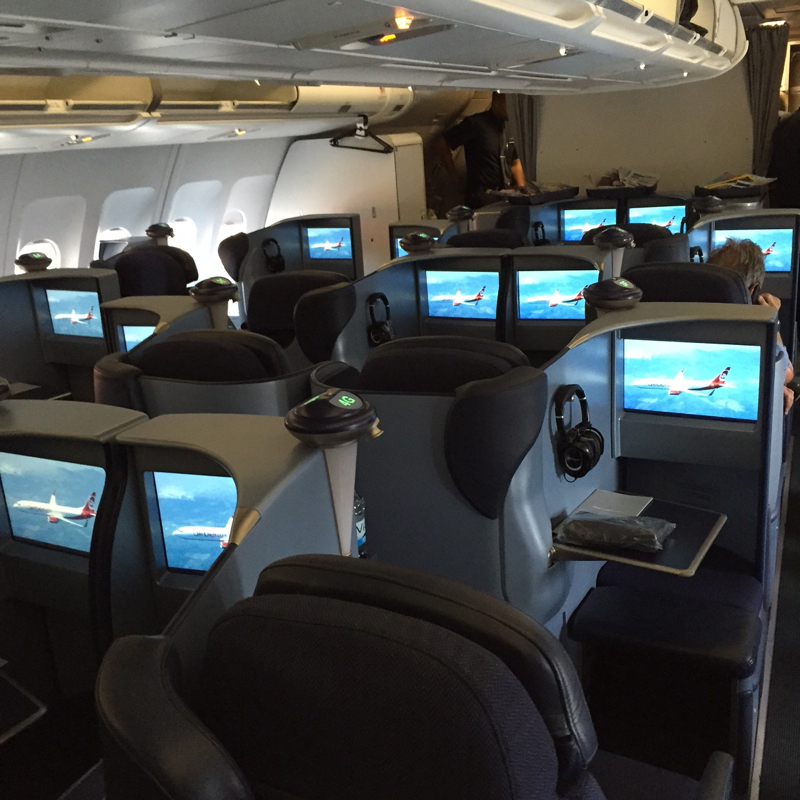 My review of Air Berlin Business Class on the A330 from Berlin TXL to New York JFK is part of a series of trip reports from my family's trip to Berlin and Italy this past summer. For more about some of our stays, see my wife's reviews of the Monastero Santa Rosa on the Amalfi Coast, Castello Banfi Il Borgo in Tuscany, and the Portrait Firenze Hotel and Four Seasons Firenze in Florence. I had a morning flight from Berlin to JFK. 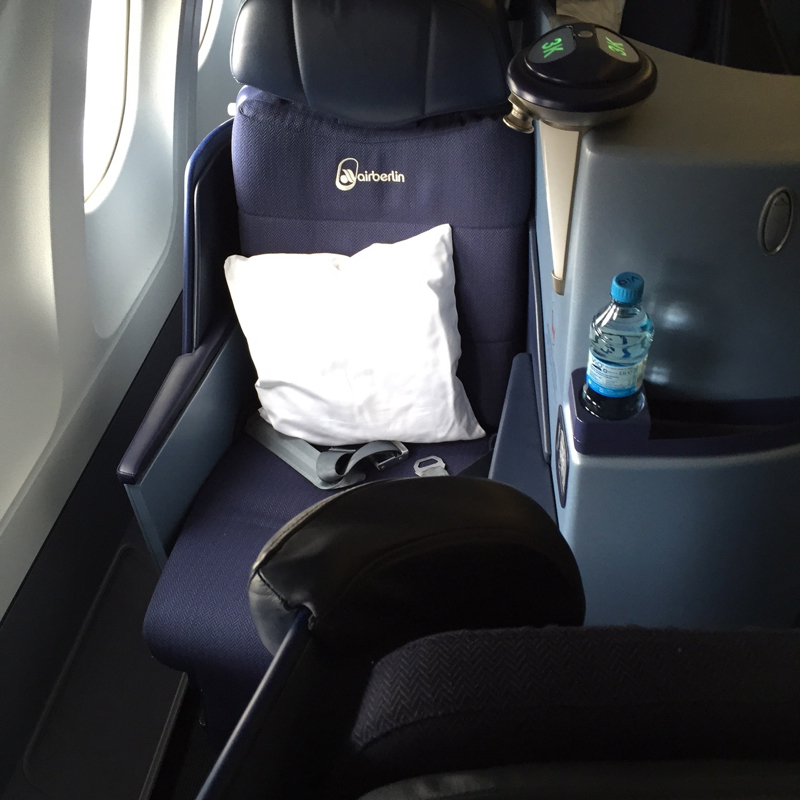 The cabin has a very efficient configuration, which was needed because all the business class seats were filled. I was initially seated in Seat 3K, by the window. 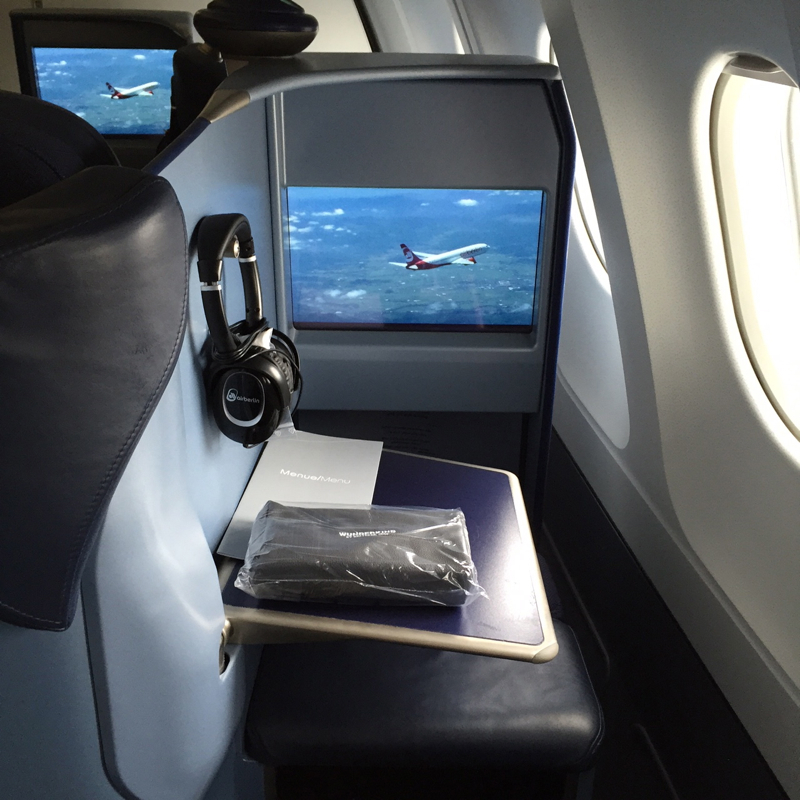 There was not much privacy in the configuration, which became all too evident when two large, loud German businessmen sat in the seats directly in front of me and also across the aisle. They talked non-stop from the moment I boarded the plane and, even with noise canceling headphones, as our tarmac delay wore on I was not able to shut out their cacophonous talk-yelling. I asked the attendant they take it down a notch (you could hear their conversation from anywhere in the cabin), but the attendant instead suggested I try earplugs. I figured they must be regulars. I began to feel a sinking sense of doom about the next seven hours, when, mercifully, the attendant told me he had located a passenger in the rear of the cabin who was willing to swap seats. I was very grateful, since although I could still hear the men, it was at least a little less loud. But if you are expecting a sense of privacy on a crowded Air Berlin business class flight, consider yourself forewarned. 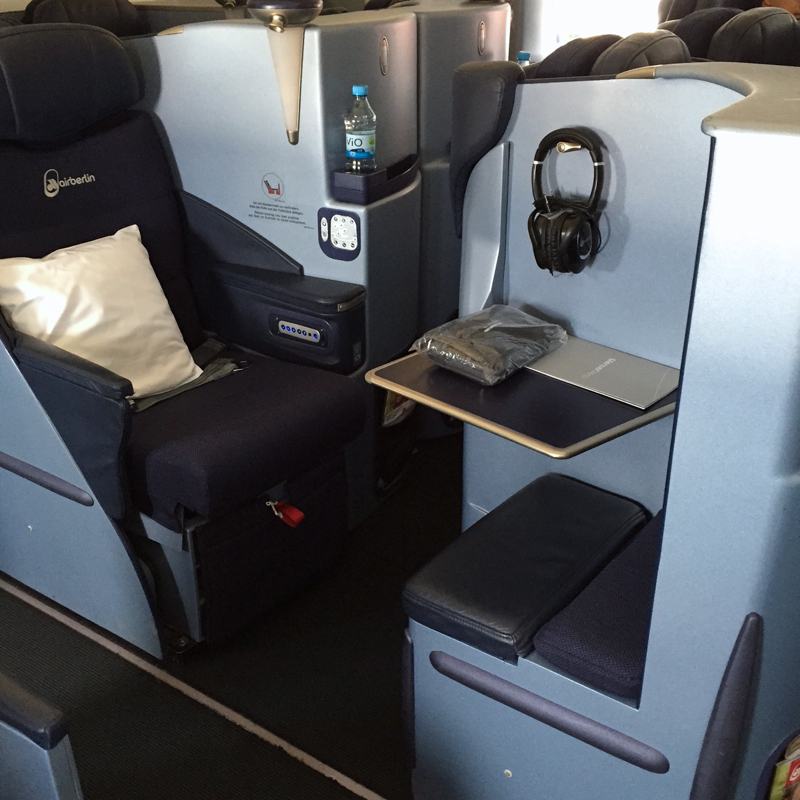 I am sure that I was spoiled from having recently flown First Class, but the business class seat seemed extremely narrow and confining. The location of the seat, between the window and the compartment wall, left little space for elbow room, and was reminiscent of fighting for elbow room in economy class, except that the walls on either side wouldn't budge an inch. In addition, I would not recommend the seat design for anyone who is tall, because, as with seats in economy, the headrest is not adjustable but is designed for someone about 5'7″ (I'm 6'5″) which means the headrest jutted into my upper back. This problem was eliminated as soon as I was able to recline using the very intuitive seat control, and then I did appreciate the length of the fully-reclined seat. 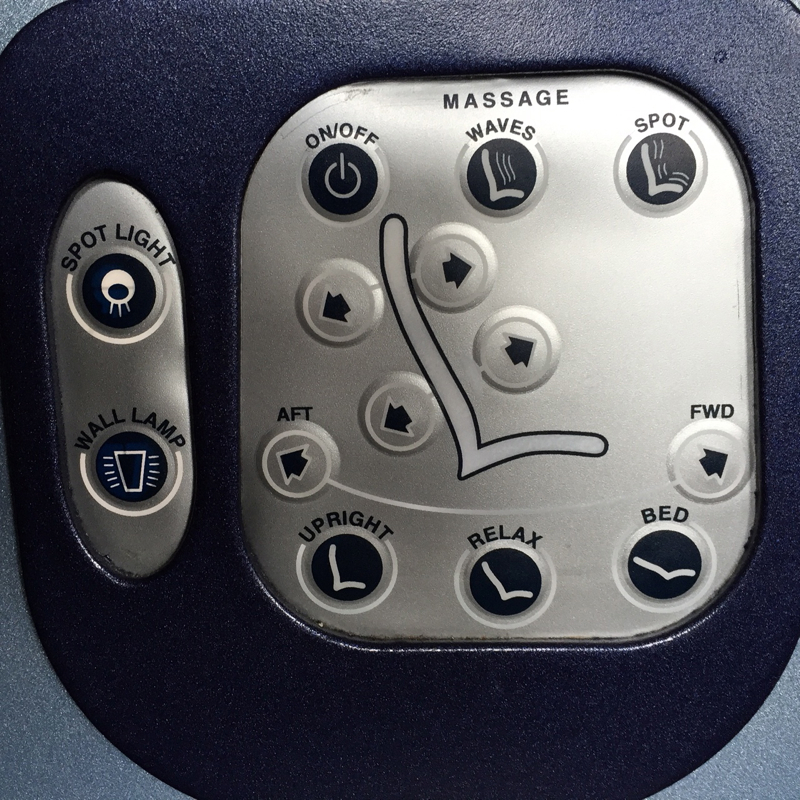 Though my flight was during the day, I found the reclined seat was comfortable enough for business class, and would have likely been good enough had I needed to sleep. 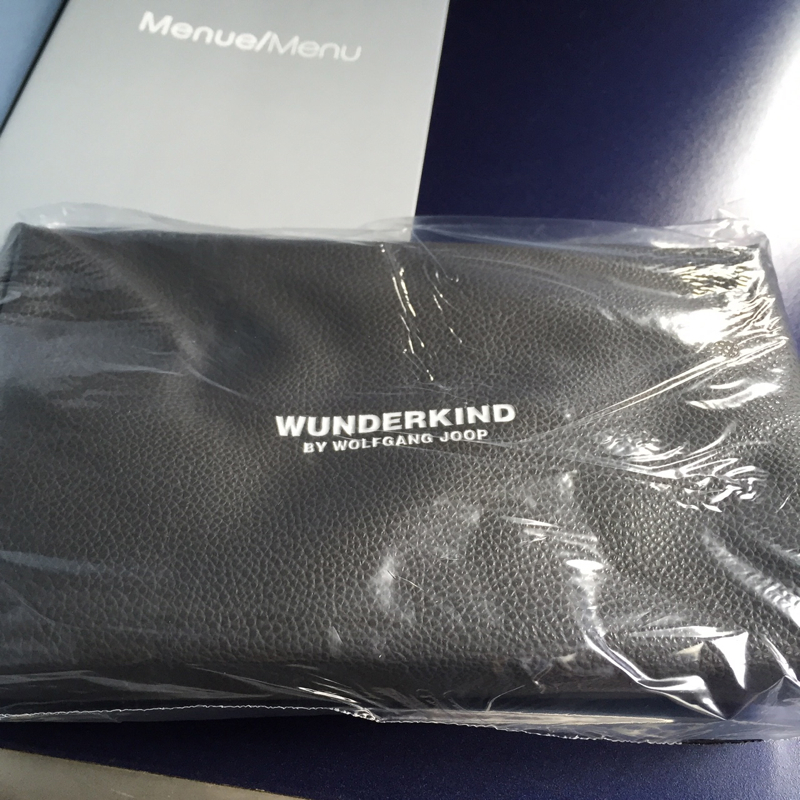 The “Wunderkind” amenity kit by Wolfgang Joop contained a face mask, sleep socks, lip balm, face moisturizer, ear plugs, and tooth brush and tooth paste. The sleep mask was non-adjustible and seemed rather tight. The entertainment system had a reasonable selection of new films and classics, but was nothing special. 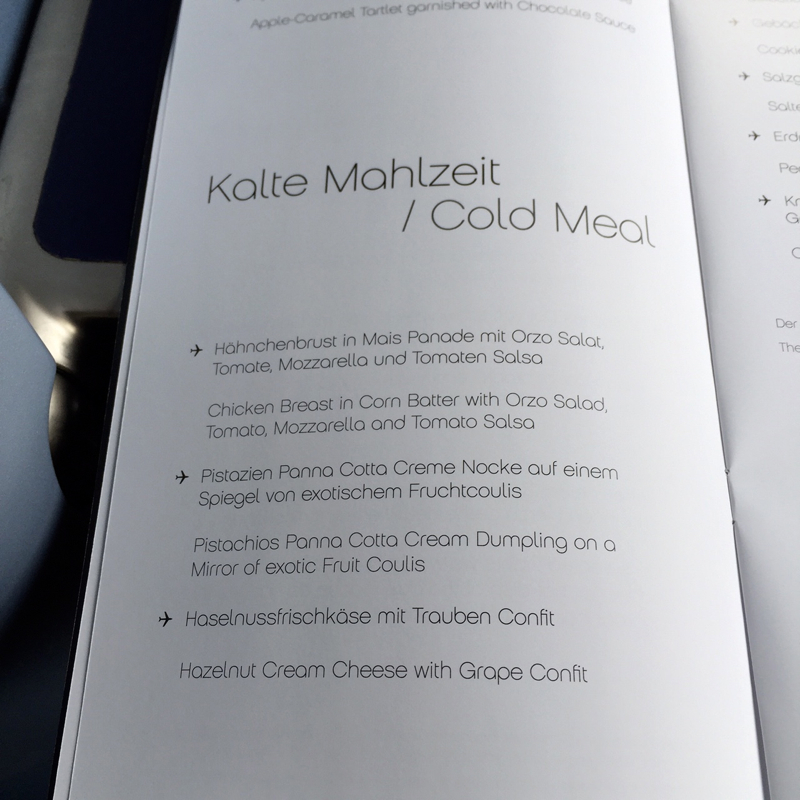 Menus were already on the tray tables when we boarded. 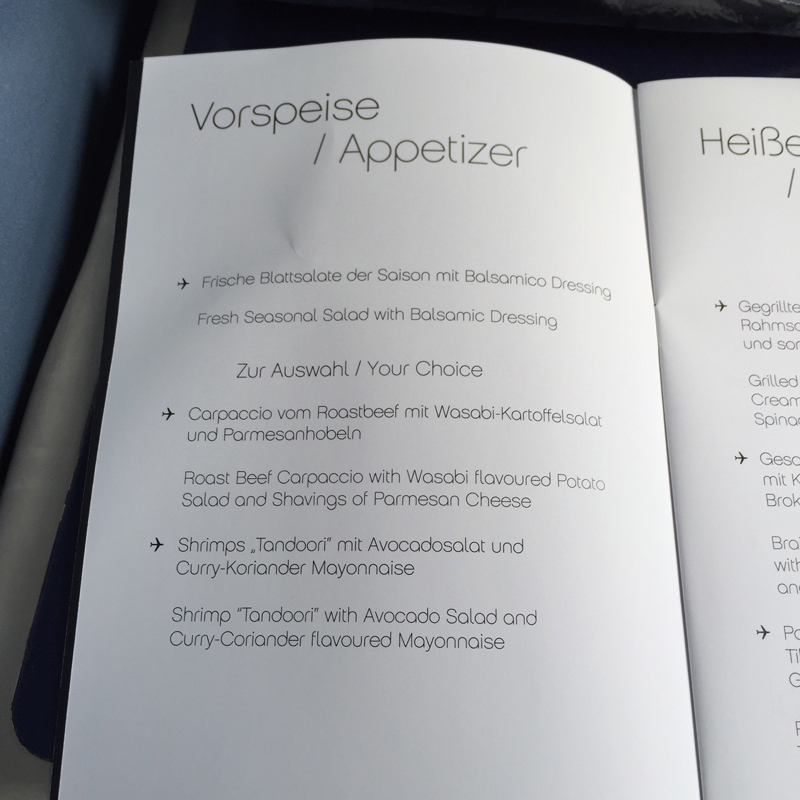 There were several choices for both appetizers and main courses, including vegetarian options. Main course options included chicken with pasta, cream sauce, spinach and sun-dried tomatoes; braised beef with a spicy Dijon mustard sauce and mashed potatoes; Pot au Feu with seafood; and Indian dal with black lentils, vegetable curry, spinach and basmati rice. 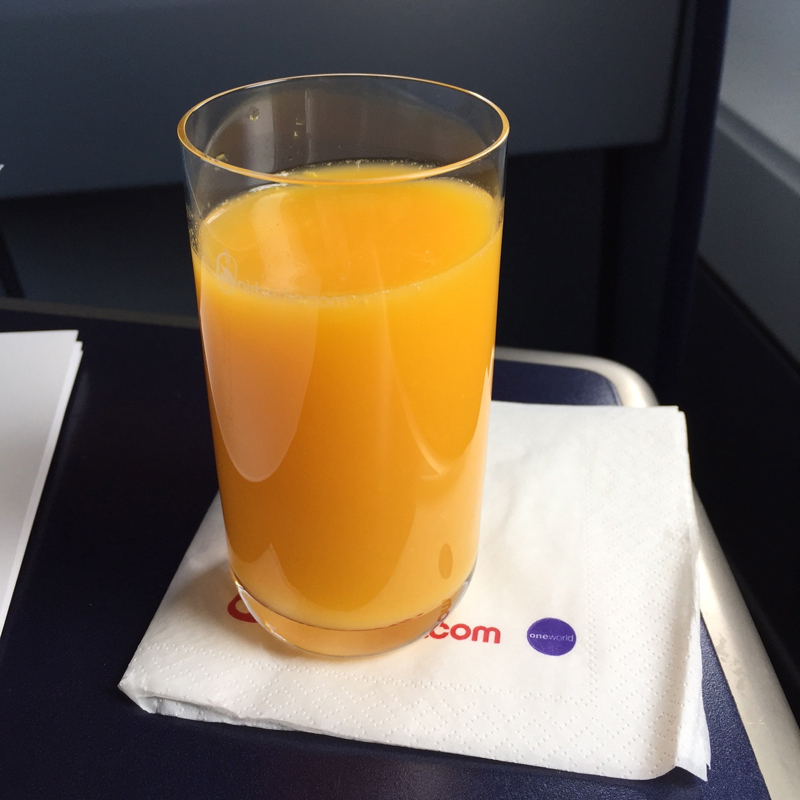 I enjoyed a fresh glass of orange juice (it was too early for the champagne) presented upon seating before takeoff. 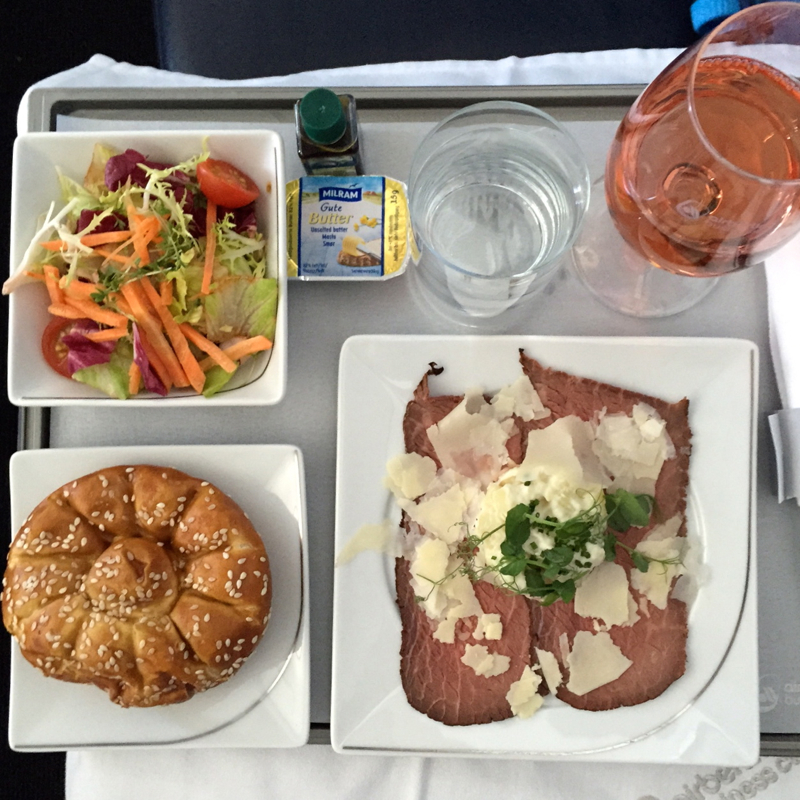 For my appetizer, I selected the roast beef carpaccio with wasabi flavored potato salad and shavings of parmesan cheese, with a seasonal salad and glass of rose. The salad and appetizer were reasonably fresh and tasty, and the carpaccio was enjoyable, even if it was rather chewy. For my main I ordered the grilled chicken breast with cream sauce on tortiglione pasta with spinach and sun-dried tomatoes, which was very good and filling, although not very photogenic. 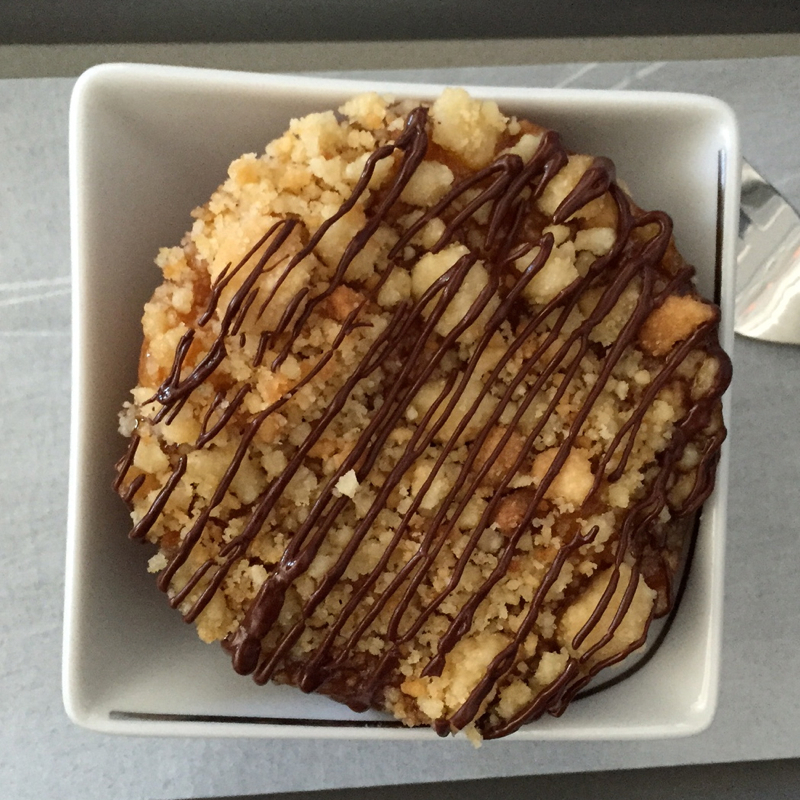 During the course of the flight I managed to consume three desserts: the apple-caramel tartlet that came with lunch, as well as the pistachio panna cotta with fruit coulis, and hazelnut cream cheese with grape confit that were part of the cold meal served before landing. 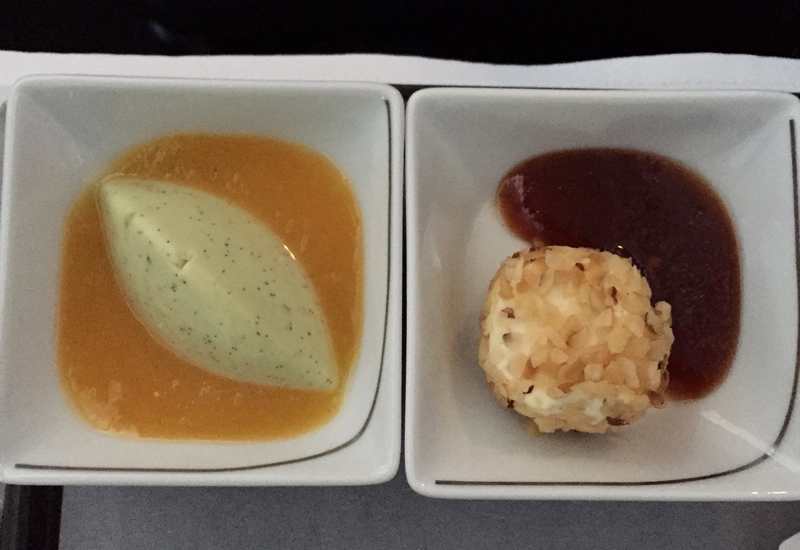 All three were delicious, especially the hazelnut cream cheese which had a strong flavor. Although I was initially let down when the attendant seemed unwilling to quiet the loud businessmen, I was very happy to be re-seated in a packed cabin. In such a sold-out flight, the attendants covered a lot of ground, and always kept a calm and cheer demeanor. So of course the service was nothing close to First Class, but in light of the circumstances I thought the staff did an excellent job. Perhaps if the cabin had been less crowded I would have had a better experience, but I still would have found the seat to be too narrow. 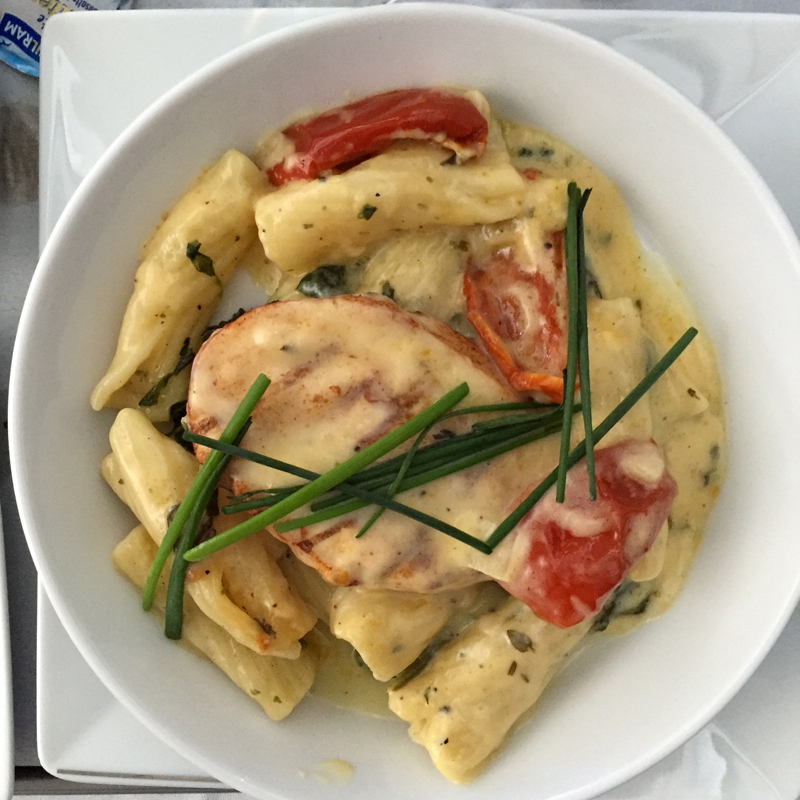 Overall, however, the food and service was good and for business class the general experience was certainly on par with similar products.